Do you believe you are burning too much wood in your outdoor furnace? If so, let's talk about this for a minute. It's getting cold right? Everybody wants to stay warm, but nobody wants to be outside for too long, even while they're filling the furnace;the temptation to to just hurry, throw as much wood in as possible then get the heck back inside the house! But it's not the amount of wood you're chucking into the firebox; it's the quality of the wood that matters. What matters most is whether or not the wood has been properly seasoned. High wood consumption can be caused by a number of factors. I will discuss here some of the more common causes of high wood consumption – many of which can be easily resolved. 1. A big culprit to burning to much wood is burning wood this: The wood has not been properly seasoned. If your wood is not properly seasoned, technically you are burning almost 40% of your wood pile just to burn off the moisture in your wood! Just because your wood was cut 1 year ago doesn't mean it's been properly seasoned; in other words, wood that's been cut for a long time does not equate to being dry enough to burn. The conditions have to be right. I have some wood at my shop that was cut 18-24 months ago and I split it last week and the moisture content of the wood is still 42%! Check out this blog post. And this one too. For a gasification furnace like the Hawken GX series, your hardwood must be properly seasoned for at least 12-24 months in order to get it to the moisture level necessary for proper operation. In other words, by Autumn each year, you should be seasoning your firewood for the winter burning season that begins one year from that time. 2. So what is the big deal about seasoned firewood? Why is it so important? Imagine your wood pile and think of the work and/or cost you incurred to purchase, haul, cut, split, stack, and cover that wood pile. Now imagine somebody coming in the middle of the night and stealing 40 percent of your wood pile. Not a nice thought. When you burn green unseasoned wood, you lose as much as 40 percent of the heating value in your wood to burn off the moisture in the wood. Where do those BTUs go? They exit your furnace in the form of steam, or create condensation in your furnace! But just think about the enormous waste! Personally, I don’t like the idea of wasting 40 percent of my wood pile, and all just because I didn't plan ahead. 3. Burning wood that isn't properly seasoned also may affect the proper operation of your furnace. Most furnace manufacturers design their products to burn seasoned firewood, so any time you burn improperly seasoned firewood in your furnace, it is like driving a car that has water in the gas tank. 4. The next culprit is insulation at your furnace. If heat escapes your furnace, you will feel warmth if you touch the skin or roof of your furnace. Of course, the chimney and door frame will be too hot to touch but those spots are designed by the manufacturer to not be insulated. All other parts of the furnace should be insulated no heat energy is lost to the outdoor atmosphere. The great outdoors will absorb an infinite amount of heat so make sure your insulation is high quality and all in place. Hawken furnaces are the best-insulated furnaces in the world – we use only high-grade R-30 insulation…the best in the industry. 5. Next, check your underground pipe for parasitic heat loss. You may want to perform a “Delta-T” test which is simply a measurement of how much heat is lost in your underground pipes. The instructions for the Delta-T test are attached below. Again, Hawken only sells the highest grade underground pipe – and at a cost that is less than half the price of many lower-grade competitor pipes. Make sure your underground pipe has a heavy outer casing (but not too heavy that it cracks! ), triple wrap insulation and a true radiant barrier. b. Uninsulated pipe in other cold areas – unheated basements or crawl spaces, etc. 8. Ash Maintenance – If the level of the ash in your furnace is too high, this kills the efficiency of your furnace and far too much of your heat will just go out the chimney. As always, follow proper maintenance procedures outlined in your owner’s manual, and maintain your furnace properly. Hawken recommends furnace owners not allow their ash level to rise above the bottom door frame. Also, ALL ashes and coals must be removed at least monthly and the inside of the firebox completely scraped out. 9. Another word on Ash Maintenance – Ash in its dry powdery state is harmless, but if it builds up and gets too thick, it will absorb some of the moisture from the wood and create an acidic paste that will corrode your steel. Do not let this happen. 10. Proper Cleaning Maintenance – All outdoor furnaces require some cleaning maintenance. Be sure to follow the manufacturer’s guidelines for proper cleaning so that your furnace will operate at its ideal efficiency. I once visited the home of a customer who was complaining that his gasification furnace was not performing well. I looked at his heat exchange tubes and they were almost completely filled with creosote! No wonder his furnace was not functioning. I asked him when was the last time he had cleaned the tubes and he said he had NEVER cleaned the tubes. He was burning far too much wood because his furnace could not get out of first gear. 11. Operating Temperature – This is VERY important. You must NEVER operate your boiler at temps below 140 degrees. No boiler (regardless of the brand) can be operated at temps below 140 degrees – the only exception to this is during “Start-up” but that is only allowed ONCE PER YEAR in the autumn. The reason for this is because wood contains moisture – lots of moisture! When the boiler water is below 140 degrees, the moisture in the wood condenses on the inside walls and tubes of the boiler and that turns into large volumes of creosote. That creosote plugs up the air tubes and this PREVENTS proper air flow. When that happens, you will not get enough heat out of the furnace, and then no matter how good your wood quality is, you cannot get a good hot burn because air cannot flow through the boiler tubes! ]Those water drips will stop once the boiler reaches 140 degrees and the remaining moisture that had condensed will dry up harmlessly during this once per year “start up”. Note that some customers will save some burned wood charcoal coals from the previous winter to use for start up in the fall. Such coals have already had the water burned out of them so the amount of potential creosote is greatly reduced. Then once the boiler water temp is above 140 degrees, they add seasoned wood. We have a fun video on the topic that you can watch at this link: Frozen? 3 Reasons to Keep your Furnace temperature Above 140 Degrees . 12. Level – Makes sure your furnace is level. Furnace manufacturers design their products to operate ideally in a level position. 13. Water temps must remain in the designated range of 172 to 182 (160 to 180 for Hawken models HE-1100 and HE-2100). If not, this will create significant problems. If your heating load pulls more heat than the rated output, your operating temperatures will drop below the recommended temperature range, and this will cause the furnace to lose efficiency and accordingly, burn more wood than necessary. a. Your wood is not properly seasoned so the boiler never has a chance from the start. All gasifiers require properly seasoned wood. b. The boiler must be cleaned every two weeks. Regardless of how dry and seasoned your wood is, all gasifiers require this bi-weekly cleaning. For tips on how to clean your GX10 properly, watch this fun video: Mindy Cleaning a Furnace IN HEELS!!!. If your boiler is not cleaned regularly, or if ANY of the cleaning steps are missed, the tubes will get clogged and you will also not get proper combustion. This will lead to the boiler operating below temps of 140 degrees, and the problems that that causes will result, thus becoming a self-fulfilling prophecy! c. If your boiler is too small for your heating requirements, then it is likely that the boiler will require wood more often than you care to fill it. This can lead to running out of fuel, the boiler temp therefore drops below 140 degrees, and again, the problems that that causes. d. If your furnace ever runs out of wood, you must schedule more frequent loading times. 14. Naturally, you will need to follow all other instructions in your owner’s manual, including keeping the furnace full of water and as always, make sure you follow the proper water treatment procedures – Add water treatment each year and submit a water sample to the Hawken Laboratory for the free water test to ensure that your warranty remains valid! Hopefully this was helpful! We promise that if you follow these instructions that you will be able to burn wood without wasting any of the actual burn power! 2.) Ash Removal - You must remove ALL the ashes from your furnace at least once a month. If you do it more than once a month, that is fine, but the minimum should be once per month. This means you scrape the bottom of the firebox completely clean. 3.) Chimney Extensions - This tip is easy to follow: if you want a chimney extension you must have a "triple-wall" INSULATED chimney extension. If you have an UN-insulated chimney extension installed in your furnace, remove it immediately. Without the insulation a highly acidic condensation forms on the inside of the chimney, drips down into the firebox and will eat through any steel. 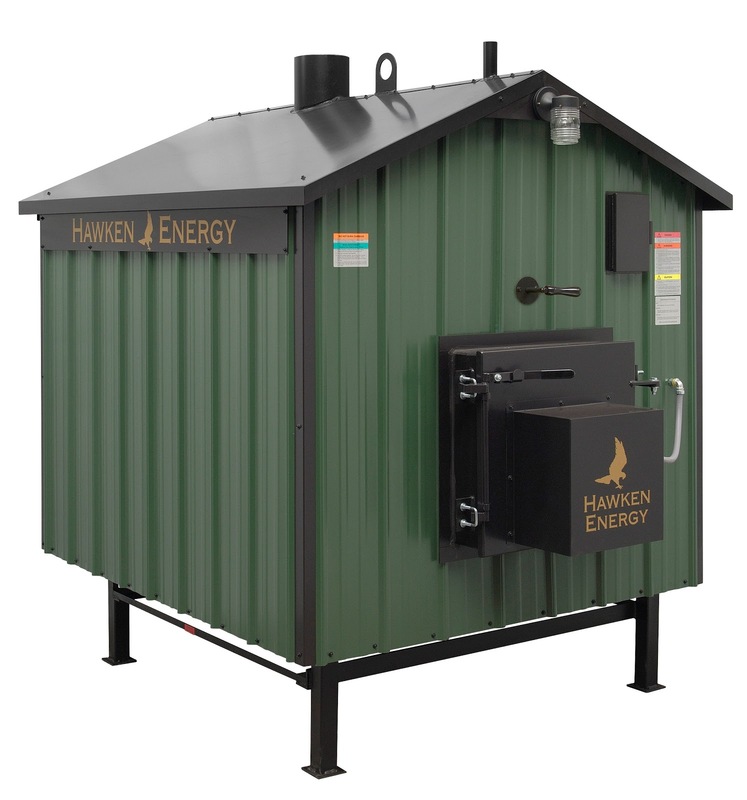 If you have any questions, or need to purchase a triple wall chimney extension, please feel free to contact your authorized Hawken Rep, or visit our online store for more info. 4.) Overfilling the Furnace - Here's another easy one: Hawken furnace owners are strongly encouraged NOT to overfill their furnaces, specifically no pieces of wood placed in the furnace should pile above the level of the top door hinge. Also, do not allow coal or wood to touch the door or the door frame. To prevent this, wood should be loaded into the furnace at least eight inches away from the inside lip/ledge of the door frame. If you do not follow this tip, excessive heat may warp the door frame, damage the door seal and shorten the life of your furnace. 5.) Aquastat Temperature - Keep your aquastat set at 180 degrees with a 20 degree differential. Your furnace actually came pre-set from the factory at this temperature. If you lower your aquastat temperature below 160 degrees, your furnace will operate at temperatures below 140 degrees. If this happens it will be harmful to your furnace because moisture will accumulate, corrosion will take place, and your furnace will NOT function properly. Please be sure to follow the instructions in your owner's manual and keep your aquastat set at 180 degrees with a 20 degree differential (10 degree differential for the GX series furnaces). Follow these procedures and your warranty will retain its validity. Yep, just like the title says, it's STILL summer everyone! In case you are one of those people reading this and panicking because you just realized you haven't cleaned out and shut down your furnace for the summer, don't panic because it's not too late. It's still summer. Hurry and clean out and shutdown your furnace A.S.A.P. and it will run much more smoothly when you start it up again for this upcoming cold season. Hawken Energy was honored to receive Mary Judnich of Senator Debbie Stabenow's office for a visit. Hawken CEO Warren Walborn met with her and showed her around Hawken facilities. The two discussed the future of the wood-burning industry. After the visit it is our hope that Senator Stabenow will encourage the EPA to create rules that will enable manufacturers to continue our efforts to improve air quality. A few days ago Hawken Energy played host to Congressman Bill Huizenga of the 2nd Congressional District of Michigan. For all of us here at Hawken it was a true pleasure to meet and discuss our common interests, our company, the industry, and the impact of the EPA regulations. In addition, Hawken affiliates are buzzing about Congressman's work with colleague and former Missouri Rep Blaine Luetkemeyer, of the 3rd Congressional District of Missouri, in support of H.R. 4407, the Wood Stove Regulatory Relief Act of 2014. Essentially what this bill would do is require the administrator of the EPA (Environmental Protection Agency) to set reasonable limits on stringency and timing of proposed regulations for new residential and wood heaters, hydronic heaters, forced-air furnaces, masonry heaters, etc. To learn more about the legislation itself you can visit congress.gov. The EPA (Environmental Protection Agency) is proposing significant cuts to the amount of pollution emitted into the air via wood stoves, pellet stoves and outdoor wood furnaces. Hawken Energy was featured in a story on WZZM13 that addressed the subject.